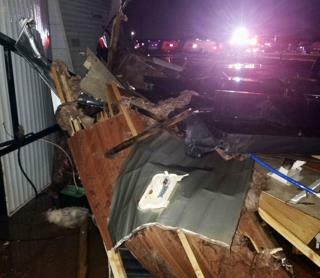 (Newser) – A newborn baby was killed and more than two dozen people were injured when a tornado whipped through a North Dakota oil patch city overnight, overturning recreational vehicles and demolishing more than 100 structures, officials said Tuesday. The storm moved through Watford City, in the northwestern part of the state, shortly after midnight, hitting an RV park the hardest, according to sheriff's officials. About 20 of the reported 28 injured were staying at the Prairie View RV Park, where high winds overturned some campers and damaged mobile homes, the AP reports. McKenzie County Sheriff Gary Schwartzenberger told the Bismarck Tribune late Tuesday that a one-week-old boy died from injuries sustained when the family's trailer home flipped in the storm. The child has not yet been identified. National Weather Service meteorologist John Paul Martin says wind speeds reached 127mph in Watford City. He says the tornado touched down in a narrow strip of the RV park, destroying 122 structures, including RVs and outbuildings. "The damage in that narrow strip is just intense; it’s complete destruction," he says. Clifford Bowden, 37, was in his recreational vehicle when the storm struck. "My dog was with me and the next thing you knew the storm picked up my camper and slammed it on the ground. It felt like we were weightless," Bowden says. "It was scary. I feel like I'm a pretty tough guy. But this storm, it made me shake uncontrollably." Schwartzenberger says another 79 structures were damaged at the park, which is home to oilfield workers as well as families. I've actually stayed at this rv park before while my husband was working there. He lived in that park in a camper for quite a while. So sorry to hear of this tragedy.